Growing your own fruit is essential, according to my grandmother Brown. She had a huge garden in Filer, Idaho with fruit trees, cane berries and strawberries when I was a kid. Most of us do not have huge yards and are actively trying to make our yards yield beauty and fruit. My own yard has grapes growing along a fence on the west side of my home. Raspberries are planted along a sunny south side yard of my yard that was just an unused gravel path. My family loves blueberries, so I used four as shrubs in our backyard landscape, knowing they would cross pollinate and give us tons of blueberries. It is very easy to use fruit trees, berries and grapes as part of your backyard landscape. If you have a smaller backyard or courtyard, you can easily grow a few berry plants and a couple of semi dwarf or espaliered fruit trees along a south or west exposure. It’s easy to include fruiting edibles in your landscape design; consider placing a wood or metal arbor along a pathway & plant grapevines to grow up the arbor, giving you fruit in late fall. 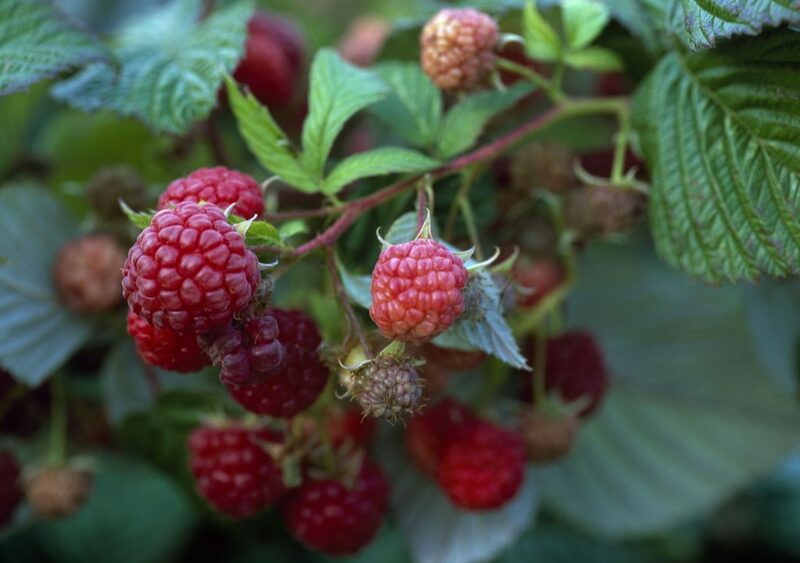 Plant a raspberry patch along a sunny side yard with drip irrigation and you will have berries in the summer & fall. We plant espaliered fruit trees to make a beautiful statement along a blank sunny wall or fence and they yield fruit in the late summer. Semi dwarf fruit trees are manageable when pruned and shaped to keep their smaller size in Idaho. 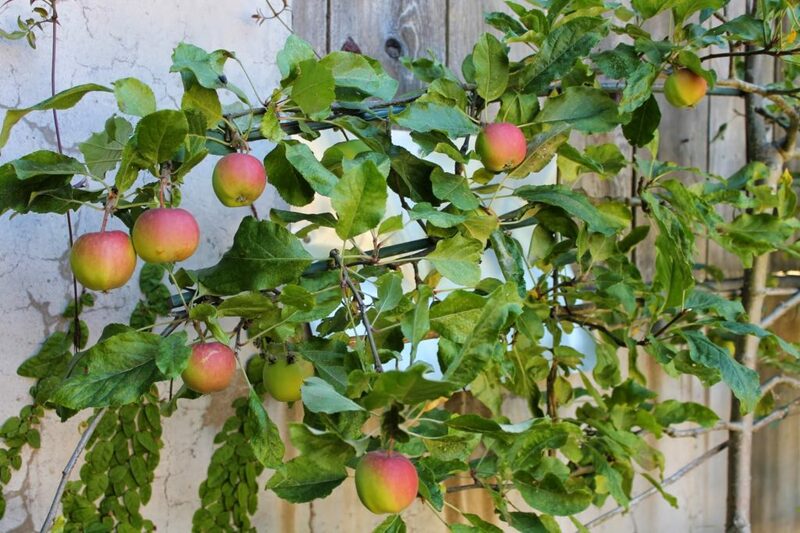 Espaliered fruit trees hug a wall or fence, using very little space in your landscape. Prune once in late Feb. before buds emerge. Fertilize March or April-Organic Gardener & Bloome citrus & fruit. Thin your fruit in June to 1 fruit per cluster (apples) or one fruit every 3-4” for more delicious fruit. Apples that do well in Boise: Fuji, Gala, Gravenstein, Honey Crisp, Kinder Crisp, North Pole and Pink Lady. Cherry varieties for southern Idaho- Bing, Carmine Jewel, Craig’s Crimson, Lapins, Montmorency, Rainier and Stella. Figs to grow in Boise: Chicago Hardy & Violette de Bordeau. Pear varieties to plant in the Treasure Valley: Anjou, Bartlett, Shinseiki Peach- Contender, Elberta, Pixie, Redhaven, Snow Beauty & Veteran. Plum varieties for southern Idaho: Italian Prune, Santa Rosa, Satsuma & Stanley. The nectarine variety we recommend for Boise is Fantasia. Cane berries are perfect in an edible landscape, plant a few berries and you will have a berry patch in no time! Amend your soil before planting with Gardner & Bloome Organic Soil Conditioner. Prune in February or March. Fertilize – March & Sept. fertilome Gardener’s Special. Blackberry varieties for southern Idaho: Black Satin, Marion & Triple Crown. Currants for Boise: Cherry Red and Crandall Black or White. Raspberry plants for our area: Boyne, Canby, Heritage, Latham and Fall Gold. Blueberries are a medium elegant shrub that produces well with a second plant and has a great fall color. Blueberries that grow well in the Treasure Valley: Berkely, Blue Crop, Chandler, Duke, Elliott, Earliblue, Toro & many more varieties. 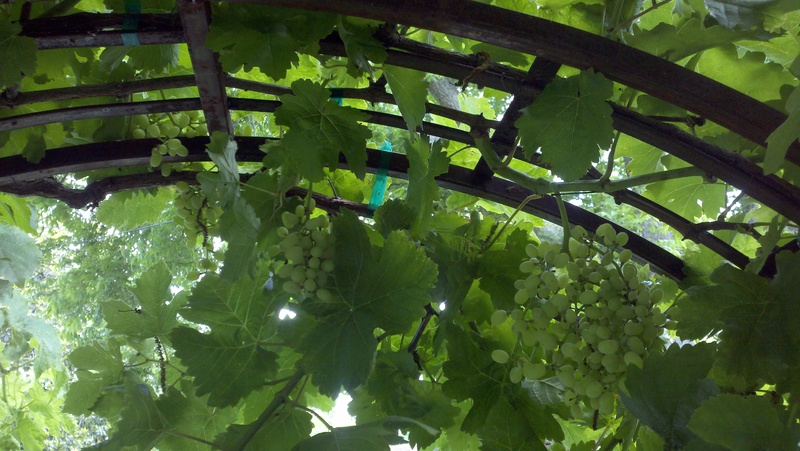 Grapes are beautiful growing up an arbor in your yard or along a sunny fence line. Cover mid summer with netting to keep birds out, harvest in the late fall after a hard frost. Grapes you should plant for harvest in southern Idaho: Concord, Canadice Seedless, Glenora, Himrod, Suffolk Red, Lakemont and Vanessa. Strawberries make a great ground cover, you can plant along the front of your perennial beds. 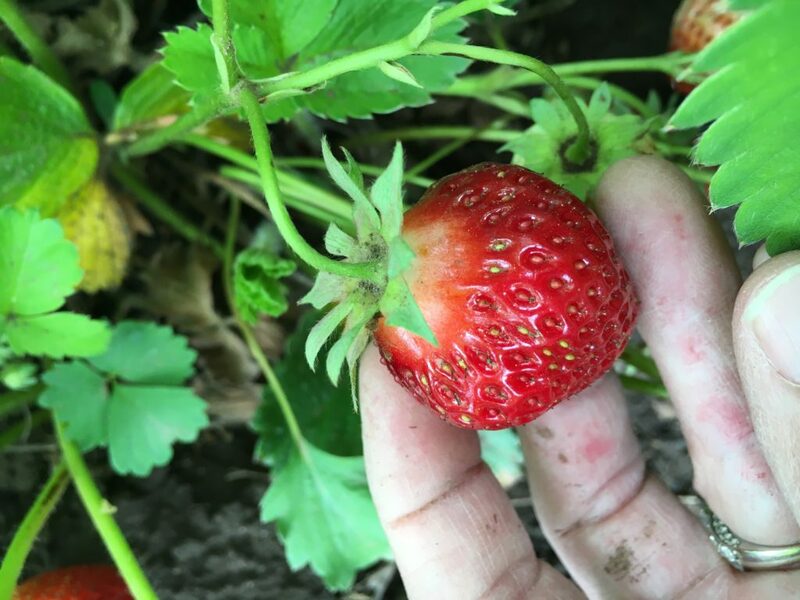 Eversweet, Ft. Laramie, Honeoye, Hood, Rainer, Tristar & Quinalt strawberries grow well in the Treasure Valley.